1890, pine and persimmon wood, original brass fittings with boss-head nails; Korea. An authentic antique document/writing box. 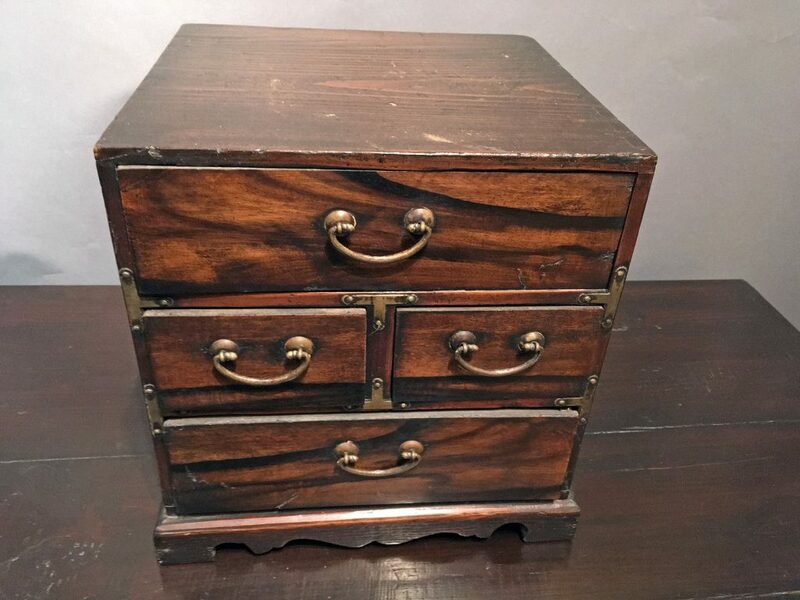 This one was in the collection of a Korean professor of Korean History and Antiquity who was reluctant to part with it because he found small antique boxes are some of the hardest to find in Korea after the last war because they are not treasured and got sold cheaply to tourists until there are not many left. This box is valuable not only for its antiquity but also it was done with simple decoration using the essence of the materials themselves: The beautiful dark and light grains of the persimmon wood and hand-made brass-work for the front, pine for framework. It is even attached to a beautifully carved base like a treasured piece of furniture. This has all the hallmark of work by a Korean craftsman of yore.